Special Monitoring of Applied Response Technologies (SMART) is a cooperatively designed monitoring program for in situ burning and dispersants. SMART relies on small, highly mobile teams that collect real-time data using portable, rugged, and easy-to-use instruments during dispersant and in situ burning operations. Are particulates concentration trends at sensitive locations exceeding the level of concern? Are dispersants effective in dispersing the oil? Having monitoring data can assist the Unified Command with decision-making for dispersant and in situ burning operations. To monitor the efficacy of dispersant application, SMART recommends three options, or tiers. 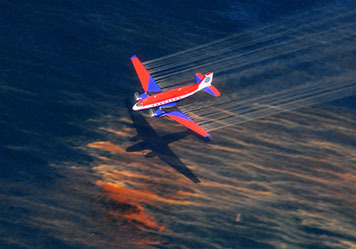 Tier I: A trained observer, flying over the oil slick and using photographic job aids or advanced remote sensing instruments, assesses dispersant efficacy and reports back to the Unified Command. Tier II: Tier II provides real-time data from the treated slick. A sampling team on a boat uses a monitoring instrument to continuously monitor for dispersed oil 1 meter under the dispersant-treated slick. The team records and conveys the data to the Scientific Support Team, which forwards it, with recommendations, to the Unified Command. Water samples are also taken for later analysis at a laboratory. Tier III: By expanding the monitoring efforts in several ways, Tier III provides information on where the dispersed oil goes and what happens to it. Two instruments are used on the same vessel to monitor at two water depths. Monitoring is conducted in the center of the treated slick at several water depths, from 1 to 10 meters. A portable water laboratory provides data on water temperature, pH, conductivity, dissolved oxygen, and turbidity. For in situ burning operations, SMART recommends deploying one or more monitoring teams downwind of the burn, at sensitive locations such as population centers. The teams begin sampling before the burn begins to collect background data. After the burn starts, the teams continue sampling for particulate concentration trends, recording them both manually at fixed intervals and automatically in the data logger, and reporting to the Monitoring Group Supervisor if the level of concern is exceeded. The Scientific Support Team forwards the data, with recommendations, to the Unified Command. SMART has already been successfully tested in the field. SMART was used to monitor both dispersant applications and in situ burning operations in the Gulf of Mexico during the 2010 Deepwater Horizon/BP oil spill, and in February 1999 it was used to monitor the in situ burning of the New Carissa, a freighter grounded offshore of Coos Bay, Oregon. Spills and exercises like these help us to enhance SMART. Special Monitoring of Applied Response Technologies (SMART) [PDF, 769.6 KB]: The SMART protocol, updated in August 2006. SMART at the New Carissa Oil Spill [PDF, 387.0 KB]: A summary of how SMART was used during the New Carissa response in 1999. Matrix Effects on Fluorometric Monitoring and Quantification of Dispersed Oil in the Open Ocean and Coastal Environment: Results of the 1999 R/V Ferrel Research Project [PDF, 519.0 KB]: A 2001 report on a 1999 research project aboard the NOAA Ship Ferrel, designed to identify the potential for matrix effects related to monitoring of dispersed oil. In Situ Burning: Find more information about in situ burning and burn monitoring. Estimated Dispersant System Potential (EDSP) calculator: This is a tool that oil spill planners and responders can use to assess dispersant application system performance. Dispersant Application Observer Job Aid: This is a field guide for those trained in observing and identifying dispersed and undispersed oil, describing oil characteristics, and reporting this information to decision-makers. Questions: Contact us with your questions, comments, or suggestions for SMART.